Marketing Engine v2.0 is designed to deliver qualified leads, nurture them and turn them into raving fans – with automation and technology at its core. Getting traffic to your website to generate qualified leads and sales. Building a relationship with all leads with a view to adding value and convert into customers. Keeping your customers coming back for more & making them raving fans. 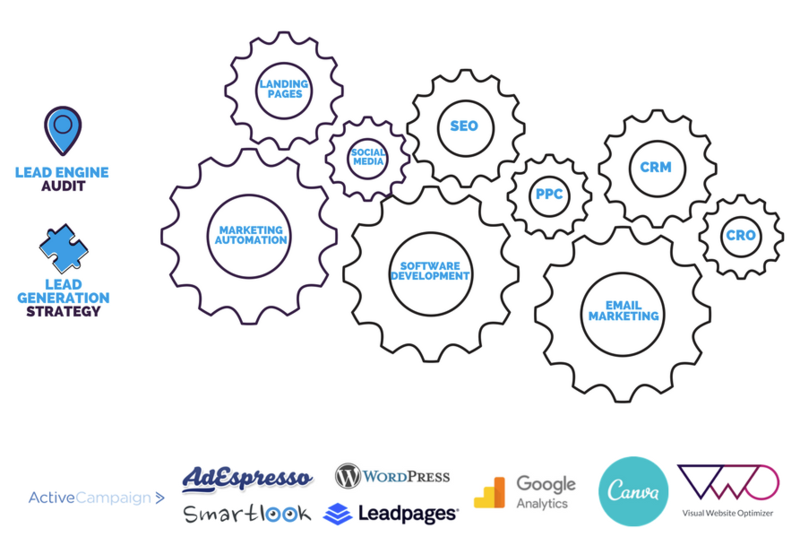 The Marketing Engine v2.0 is built on a number of core components, processes and tools to deliver effective Digital Marketing. Each Marketing Engine is configured specifically to each client. Campaigns deliver qualified and profitable leads through a mixture of the core components and ongoing testing and optimisation to achieve the target Cost Per Acquisition (CPA). People have a very short attention span and it’s unlikely they’ll buy from you the first time they visit your website. Therefore, all your marketing activities need to deliver a Direct Response. The best approach is to understand who they are by capturing a name and email address in exchange for something that will add value to them. What is your customer really worth to you? The business that can spend the most to buy a customer will win all day long. With this figure (with an understanding of your marketing, traffic costs and conversion rate), you’ll be able to identify what you should be paying per lead – which is a key factor in your Marketing Engine v2.0 implementation. Are you confident that you are maximising your Digital Marketing spend? Businesses can no longer afford to focus on a single platform. Omni-channel marketing is going to be a key factor to success.